Come & Strut Your Stuff on the Catwalk! As part of this year's Conch Republic Days Celebration the Upper Keys BPW and Snappers Restaurant proudly bring to you........ The 6th Annual Conch Republic Days Stiletto Strut, Sandals to Stilettos and everything in between! 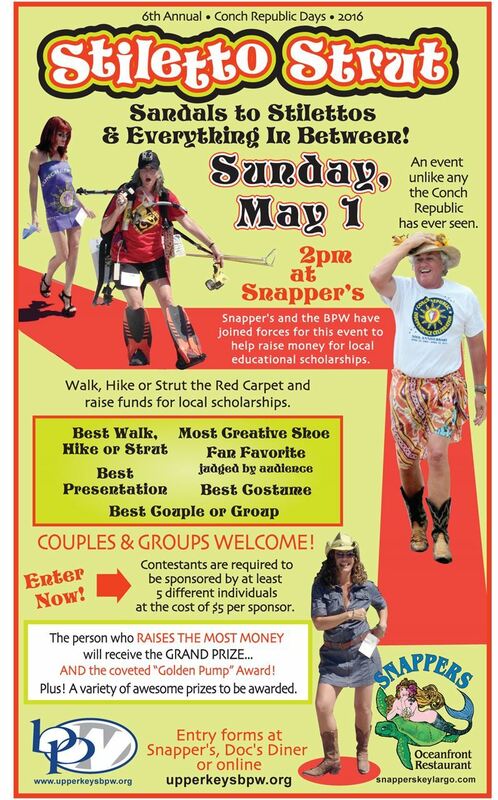 Walk, Hike or Strut the red carpet, raising money for our scholarship fund. The Stiletto Strut is open to both men & women and there will be plenty of prizes to go around. This year, groups and couples are welcome too! To participate please raise at least $25, but remember the person who raises the most money will receive our "Golden Pump award". The entry form and sponsorship sheet is below. just print it out and fill it up. Sponsorship money and forms must be brought with you on the day of the event. We will be checking in individuals and collecting their paperwork just before the big show. This is going to be so much fun. Don't miss it.